Global warming means it is imperative to find strains of wheat that can thrive in higher temperatures. SPLat is helping the University of Sydney with their research. Scientists at the University of Sydney Narrabri Plant Breeding Institute want to simulate the effects of a hotter climate or heat waves on different breeds of wheat in order to find suitable varieties to grow in Australia. The experiments require 20 separate chambers, each with its own reverse cycle air conditioner. 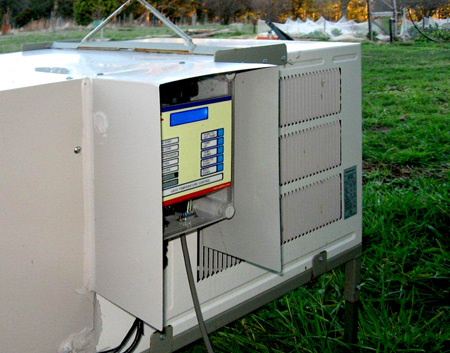 $600 commercial A/C's, while being cheap, clearly do not do what is actually required, so the factory controller was stripped out and replaced with a SPLat MMi202 controller mounted on the side of the A/C, with its user interface easily accessible. "The advantages of using the SPLat controller in this situation are numerous. The prices we were getting from refrigeration companies to provide a package to do what we needed were crazy, meaning the project would never get off the ground. The SPLat controllers have proved to be very affordable. But the real advantage is that we own the program! And we have the ability to make changes as the scientists dream up new ways to stress growing crops, we do not have to keep going back to a refrigeration company to get changes done. Many of the Ag students involved enjoy the variety of learning about the program, and importantly, how to change various settings inside the program to make it do what they want."